Recently I’ve been asked a lot of questions about building your own website. Farmers have been asking me if they can do it. The answer is, of course, you can. Is it hard? Nope, not compared to back in the day (mid 90’s) when you had to handcode everything. Websites are much easier to build and there’s several companies that would love to do it for you like Wix or Square Space. But if you want to DIY it. Here’s how I would go about it. 1. Get your content together first! Honestly you would not believe how many people want to jump right into the website build without any content prepared. 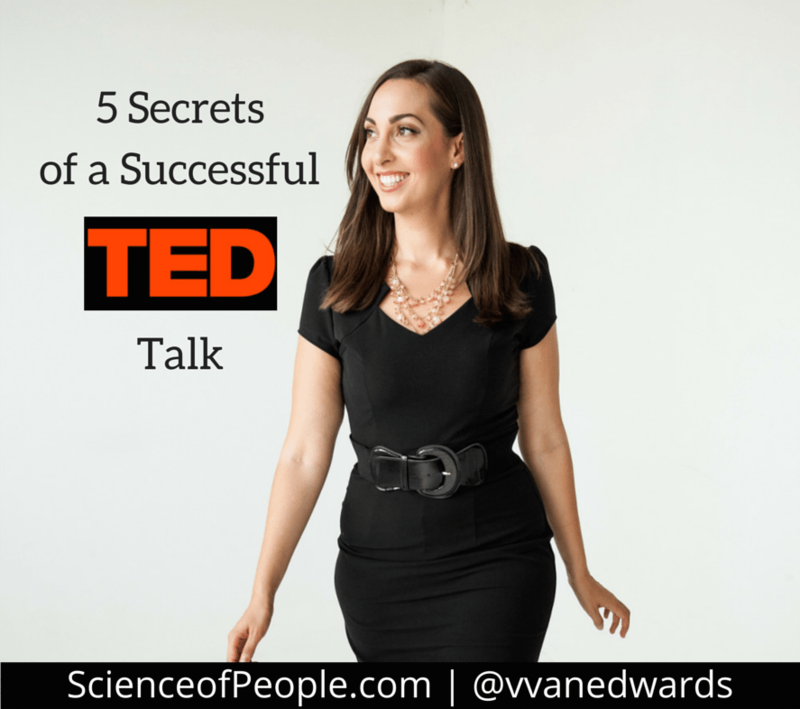 How do you know what you want to say? When it comes to a print brochure, you never start the design without having the content. The content is crucial to the design. Websites are no different. Start with the content first! What content is normal? I would see these as navigational items on a dairy farm website followed by what question it answers for the customer. Milk Production – How is milk made? Animal Care – How do cows live? Our Community – What is it like where you live? 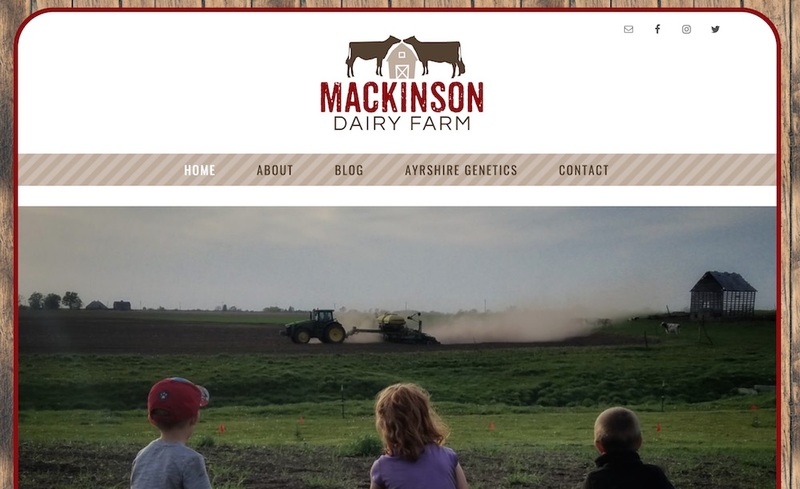 About Our Farm – What else is on your farm? How does it run? Contact Us – How do I ask another question? Journal/blog – How can I see what it is really like to live on a farm 24/7? 2. Think about what you want people to do or know about your farm. This is your CALL TO ACTION. Make this the most important call out on the website. Think about these questions when you are putting it together. Do you want people to reach out to you if they have questions? Do you want people to visit the farm? Maybe take a tour? 3. Should you setup with wordpress.com vs. wordpress.org? Well, that depends. First you need to ask yourself “why” you want to self host. Here’s a general list of pros and cons. Why I initially went with wordpress.com? I wanted more control over the plugins I could use. The costs are very small. I wanted to capture email addresses and have more control over the design. Personally, if you are new to blogging or websites, I recommend wordpress.com. It’s a lot easier to set up and get going. 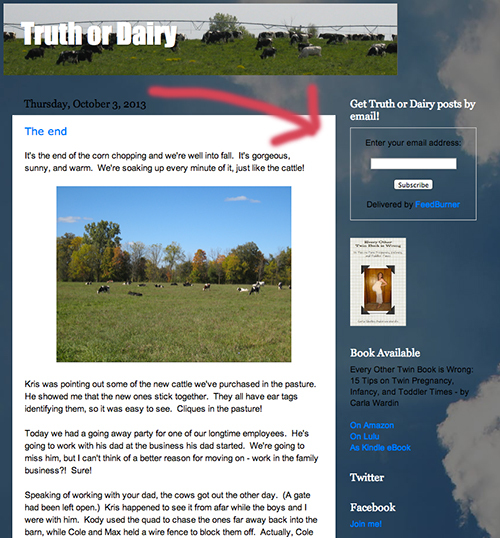 If you are looking for something even easier than wordpress – I recommend blogger or tumblr. But if you really want to use wordpress.org and control your own website then I recommend using WP Beginner or WP Learner. Read through the beginning steps before starting. If you select, wordpress.org you can buy your domain through them or buy it through another company like 1and1.com. These are not affiliate links – I just happen to use them. You’ll also need hosting. You can buy that through several companies. The guides will explain all of this. There are many companies out there and I’ve used GoDaddy, Hostgator and Rackspace to name a few. Both wordpress.com and .org have great templates. There are several things that I’m looking for in a template. Mobile friendly/optimized. More people are reading with their portable devices and you don’t want to be a pain for them. Clean design focused on large photos/graphics. Don’t get something to clutter – the user’s eye won’t focus on the content you want them to. The ability to add right or left side widgets but not both. I like sharing widgets how to connect with me and capture email as well as show them what posts are popular. 5. Make time to write once a month or more. Putting time on the calendar is the most important thing. Block the time it takes and spend the time it takes. Don’t underestimate the time because then you’ll blow it off. You are going to need a few hours for your first posts. After that it gets easier. What topics should you write about? Well, that depends. Everyone is going to tell you to write about your passion which I assume is your farm. I write about marketing and how to do it better. That keeps me going. 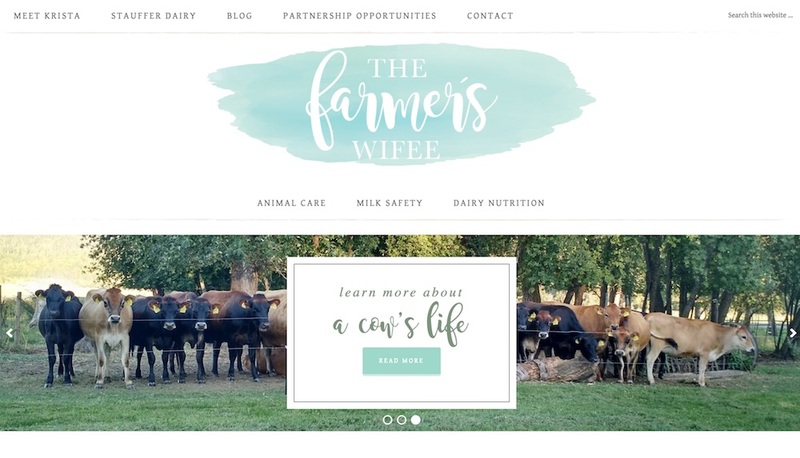 But if you want to attract an audience, which I’m pretty sure you want to do then you should be writing about what your customers want to know about farming. Most farmers I know are awesome storytellers and you should incorporate that into your writing. If the topic is animal care, then don’t just bullet point the checklist you follow for cow health. Write a story about how you accomplished the checklist or what went wrong and how you fixed it. Nobody wants talking points – they want to laugh, cry or think about what happened on the farm. And some days a picture can be all that is necessary to convey this. What topics would I focus on? Animal Care, dairy farming activities, struggles and successes, how the community plays a role in the farm, how you play a role in the community, what you feed your family, what you do for fun with the family, how you are improving your farm, your opinion on just about anything, what hobbies you have…remember most people are pretty far removed from the farm and they are intrigued with the lifestyle. 6. 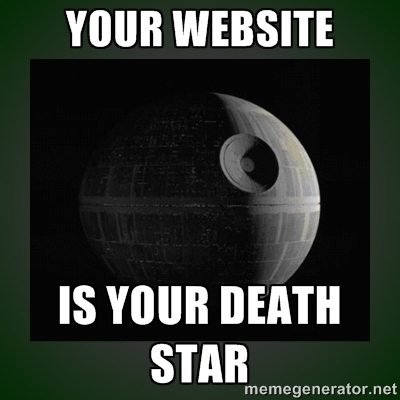 Set up Google Analytics and Google Webmaster Tools. After you get the website up and running, it’s time to add some tools that will make your life easier. 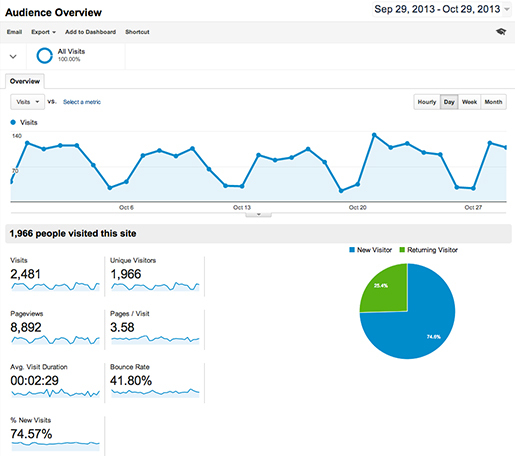 Add Google Analytics – this will let you know what people are doing on the website. Where they are going, what they like, what they are sharing, where they are coming from. Add Google Webmaster Tools – this will tell you how the website is performing in Google’s search engine eyes. Can they search it effectively? 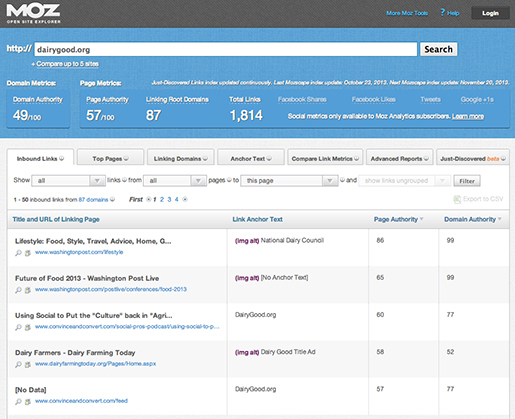 What keywords are people searching on and finding your website? What pages are broken? All sorts of great stuff and it’s free. The final step is probably the toughest when it comes to having a website. How are people going to find it? 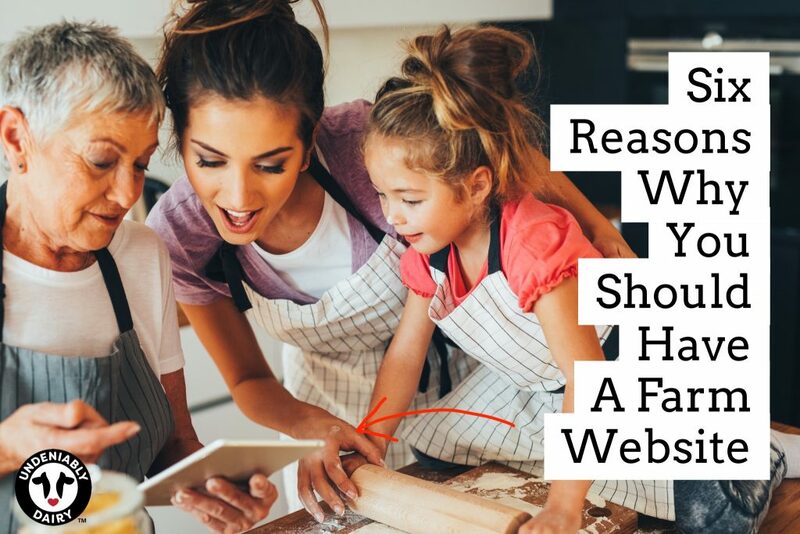 While I have a few steps you can do, I’m definitely going to be writing a larger post about getting your website out there but in the meantime here’s a few tips. Share your posts on social media as much as you can. I hate to bust your bubble but most people don’t see everything you post – in fact, it’s quite the opposite. So I would be oversharing as opposed to undersharing. And by social media, there is more than just Facebook out there. Use Twitter, LinkedIn, YouTube, Pinterest, Instagram, Reddit, etc… If you are serious about blogging, then you need to be serious about using social media for the exposure and interaction. Share with the search engines. You can use pingomatic.com to post and it will ping the search engines to come check out your content. 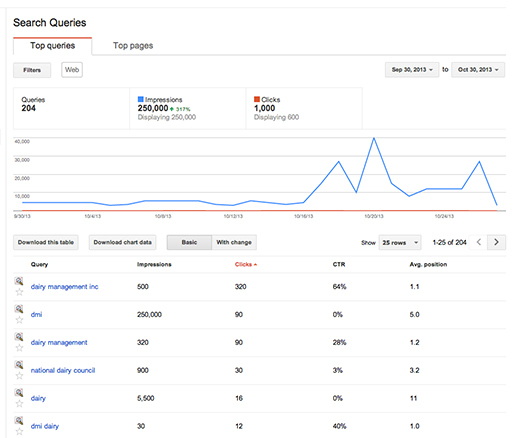 BTW, Google normally visits a site once a month until you get popular then they could visit a few times a day. Share via email. When you are first starting out, it’s ok to spam the family until they get tired. Make sure to ask them to share as well. You never know who they are all connected with. OK, well that’s basically it for the beginner level. If you have questions along the way, feel free to hit me up and I’ll try and answer them. You can leave a comment below or just email me using the links on the right hand side. Good luck. Can’t wait to see your site! When you sit down to do a digital audit, it’s helpful to have your marketing communications goals and objectives in hand so you can see if your digital properties are laddering up in some ways to your farm or business’ overall goals. 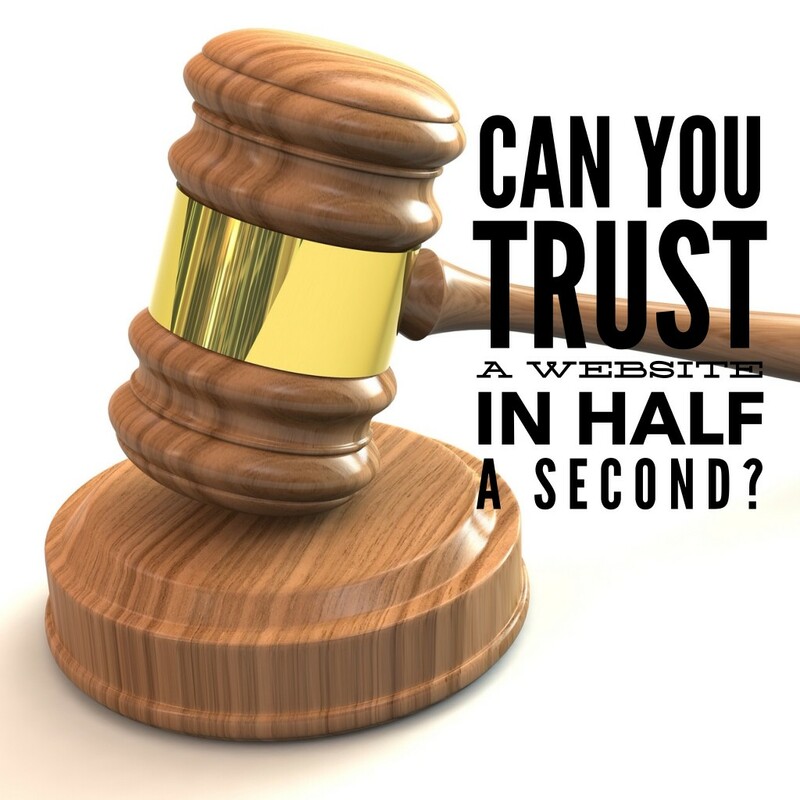 To me, your website is always your digital home on the web (don’t trust social networks like Facebook or Twitter to keep your “home” intact – glitches can completely remove your presence) and is probably the best place to drive your target audience if you want them to take a specific action – in other words, your CALL TO ACTION. What’s your CALL TO ACTION? While a digital audit can help you see what is going on with your digital properties, you need to make sure that your CALL TO ACTION is easy to see and act upon for your target audience. 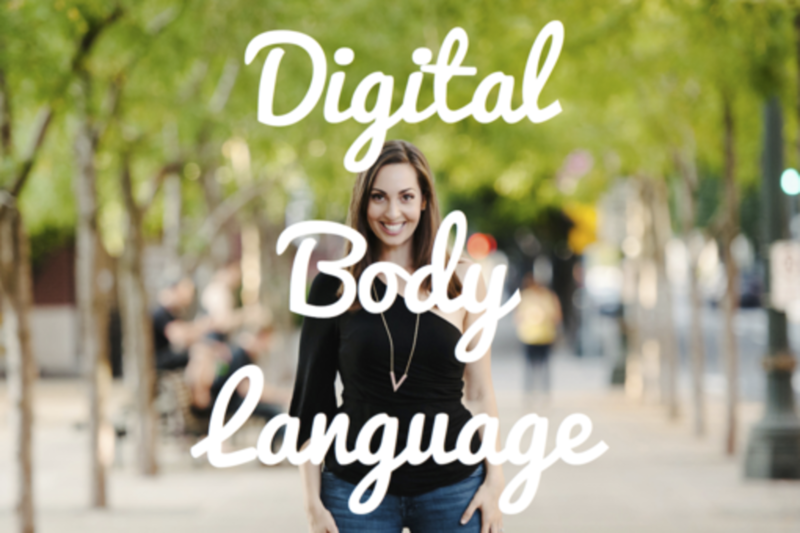 You need to be clear on your CALL TO ACTION on all your digital properties. This is done visually as you look at your properties whether it be a website, blog, facebook page, or youtube channel. The web is very fluid and you need to be ready to change what you have. Always be thinking of building with the future in mind – what is hot right now with Google is Social, Local and Mobile (SO-LO-MO). In the future according to the experts, instead of the battle over what’s in your hand and in front of your face (computer vs. mobile phone vs. tablet), it will be your voice and what’s in your vision (think Google Glass and screens that respond to voice and motion). But what you need to worry about now is your digital footprint (digital footprint is the results people get when they search for your farm/business/name in Google or on the social networks) and how your digital properties are performing. 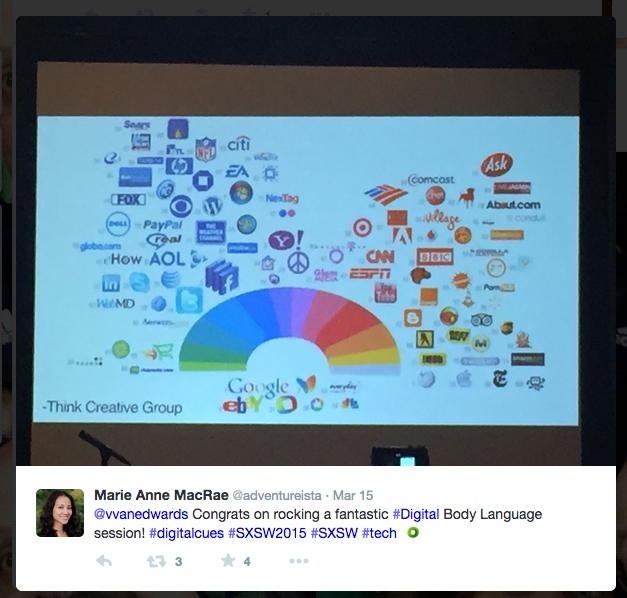 First, you need to pull together a list of all your digital properties. Do all the ones you know and then make sure you do a search through Google with your keywords and names to make sure nothing else pops up. 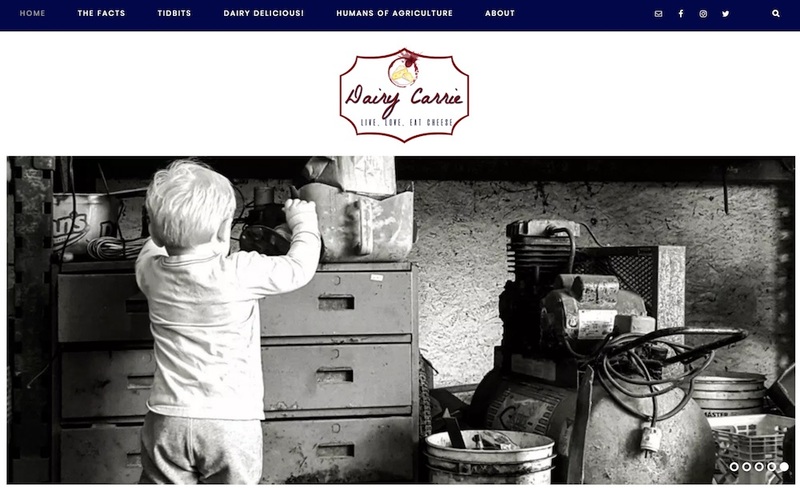 You might find things you didn’t know about or that someone else might have created for your farm or business. And it’s always good to have searches running on your farm or business with talkwalker.com alerts (free service). Once you have that in place, we’ll begin was analyzing your websites and blogs. You should have some sort of analytics on your websites. I recommend google analytics. If you are using Urchin, you need to switch over. Your web person should know how to put google analytics on your website or you can do it if you can access to the code – depending on the blog system they should have a plug-in for this. 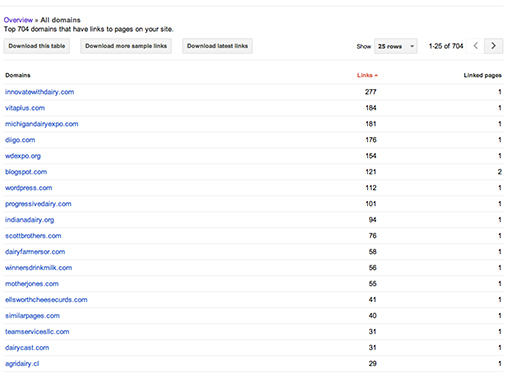 I’m not going to go into the details here but you should have a sense of your traffic, time on site and bounce rates. The overview can help you here but be aware it’s really not the whole story. What you are looking for here right now is trends. Are people using our CALL TO ACTION? Are we going up or down in visits? Where are people leaving the website? You need to have your web person set you up with Google Webmaster Tools – this will help show you things like Search Queries (Google Analytics won’t show this anymore if people are logged into Google when looking at your website), Crawl Errors, how many inbound links to your website and how to optimized your website. The information you really need here is do I have any errors, what are my search queries keywords and how many inbound links do I have? Also, who is linking to me? You should benchmark this number and then try and grow it in the future. The more inbound links you have the better you are – but just stay away from black hat link building techniques (don’t buy them and don’t submit to useless directories). It will also show you where you are ranking on Google search engine research pages for keywords – it other words, how are you showing up? 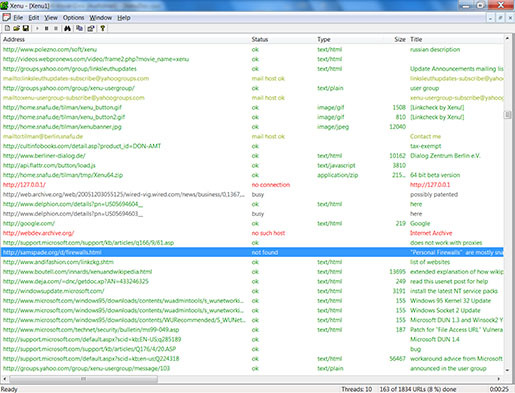 Xenu’s Link Sleuth checks Web sites for broken links. Link verification is done on “normal” links, images, frames, plug-ins, backgrounds, local image maps, style sheets, scripts and java applets. It displays a continuously updated list of URLs which you can sort by different criteria. A report can be produced at any time. Probably one of the best tools out there for link checking and it’s free! I use Open Site Explorer to help benchmark the performance of the website. 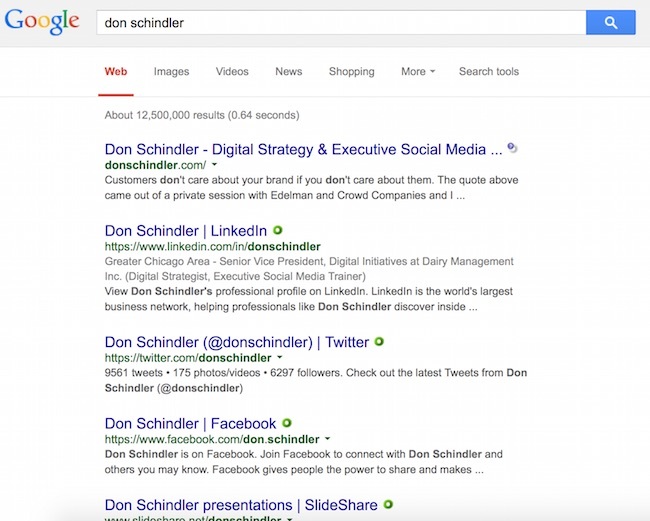 Much like Google Webmaster tools this will help with showcasing who is linking to you but it will give more information on the sites that are linking to you. The stronger those sites are, the more power they transfer to your website. 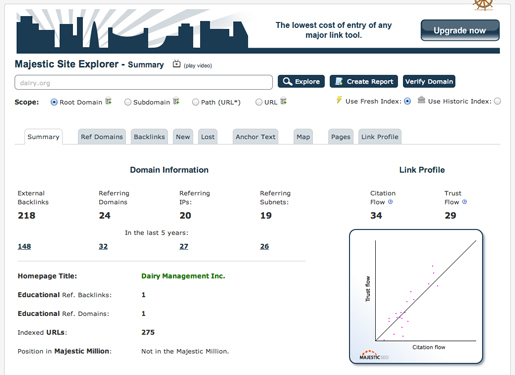 MajesticSEO will give you a lot of great information as well much like Opensiteexplorer but you’ll have to login. 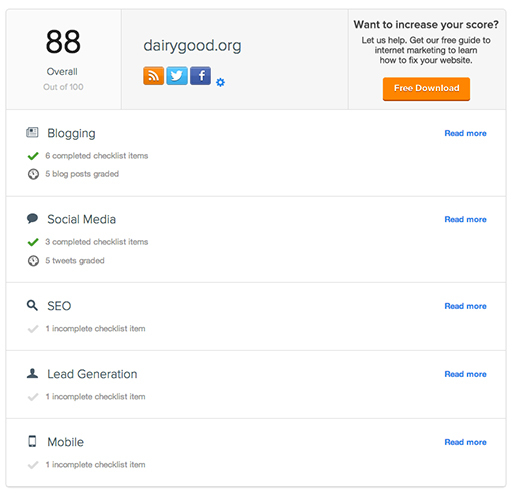 This is Hubspot’s free marketing grading system and it will give you insights into how the website is performing (0-100 is the grading scale). The information they provide is pretty self-explanatory. While they provide some nice insights, be aware they are trying to sell you a product and will probably reach out to you when you use the tool. I do think that Hubspot is awesome but I don’t know how much help they would be for you right now. Here’s a great article on how to do this yourself from Philip Petrescu, CEO and Co-Founder of Caphyon, How To Perform a Complete SEO Audit for your website. This is a very thorough article and I love all the insights and how to fix ideas he has. Definitely worth checking out. 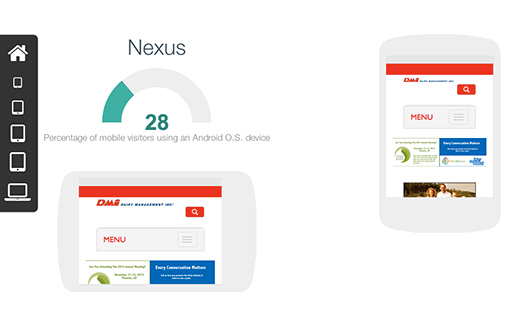 The speed of your website is very important to users and Google. The search engine could downgrade your website if it is not running at a fast enough pace or if a script is slowing it down. 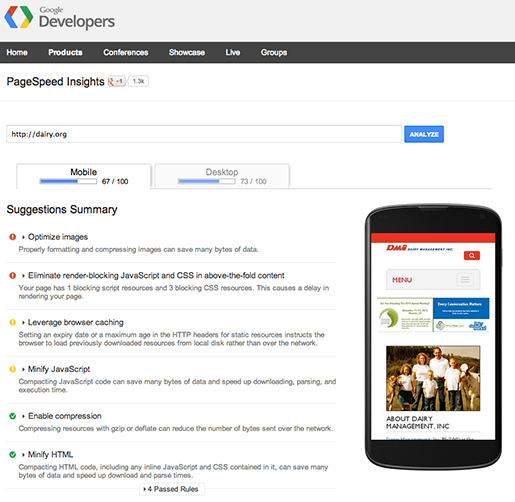 Use the Google Developer Speed tool to benchmark your website. It will also give you a Performance Grade, Load Time and Page Size. Google is not happy with multiple website for mobile and would rather you just have one to meet the needs of mobile users. 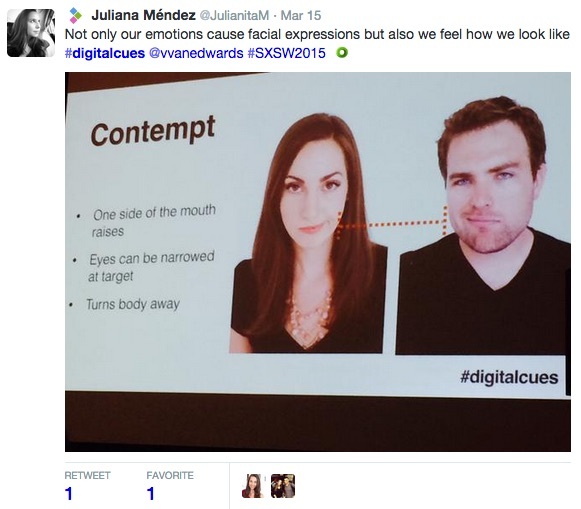 That’s why going responsive in a redesign is a great idea. But you need to see how users are seeing your website on their mobile phone so I suggest using Hubspot’s Mobile Device Lab so you can see how your website will render on different devices. Not everything is represented here. If it’s hard to navigate, it could cause people to leave the website without doing anything (bounce) and hurt your rankings. There are probably a bunch of things I’ve missed in the audit (you know like checking different browsers, etc…) so feel free to hit me up with this information. I’ll add it in if it’s valuable. 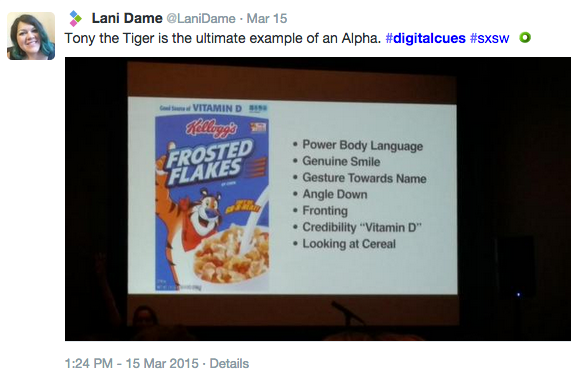 Next post will chat about digital audits on your social media presence. 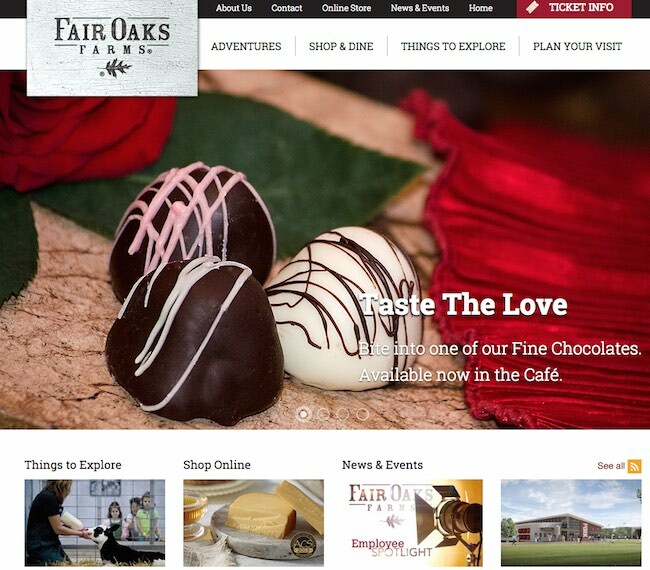 Why do websites need a content management system? I’ll give you four reasons. Yes, I know I have issues with this. I really dislike websites not built with a content management system. Because you’ll always need a webmaster. This was a good job to have a few years ago because you would be the only person who had the keys to website. You were the gatekeeper. If anyone wanted to change anything including just text, they had to go to you, the person with the knowledge of how the website was built. That is unacceptable in my book and for this day and age. Because you don’t know how people will be visiting your website. Mobile traffic is up everywhere. Do you really understand all the different browsers and how your website will look in them? It’s not worth your time to adjust, adjust and re-adjust just to get two pictures to line up on your website while looking through Firefox, Google, Safari and the dreaded Microsoft Internet Explorer. Whoops, I forgot all the mobile browsers. Better check those, too.